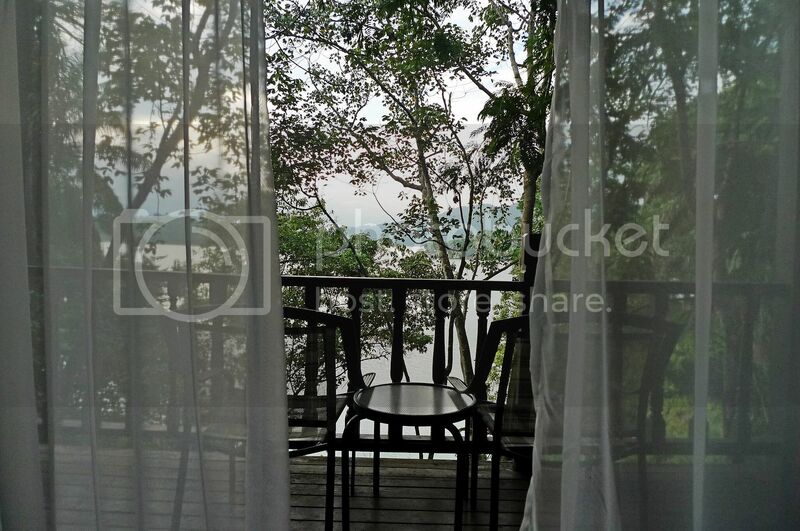 Something strange and frightening happened during my stay at Lake Kenyir Resort and Spa. I will tell you all about that in a future post, but for now, let us visit the chalet where I stayed for 2 nights with my blogger friend and travel partner. The Lake Kenyir Resort and Spa covers over 60 acres and stands majestically on the banks of Lake Kenyir, reputedly Malaysia's largest lake. And guess what? It's actually a man-made lake! The 260,000 hectares lake contains an astounding 340 islands, with 14 big waterfalls to boot! Isn't that amazing? 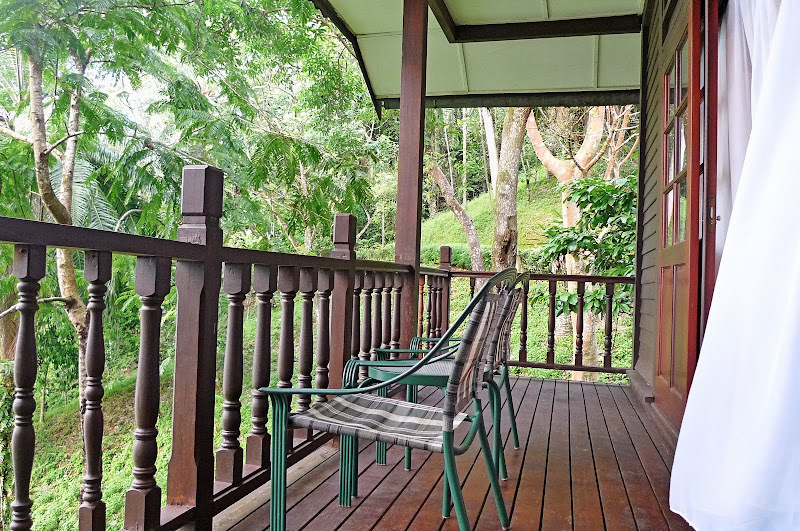 Surrounded by the world's oldest tropical rainforest and in close proximity to Taman Negara, this is the ideal place to relax and refresh the spirit! One thing I can assure you is that you won't regret visiting Lake Kenyir. Lake Kenyir Resort and Spa where we stayed is a world class 4-star resort and it comprises 135 individual timber chalets of traditional Malay architectural design. 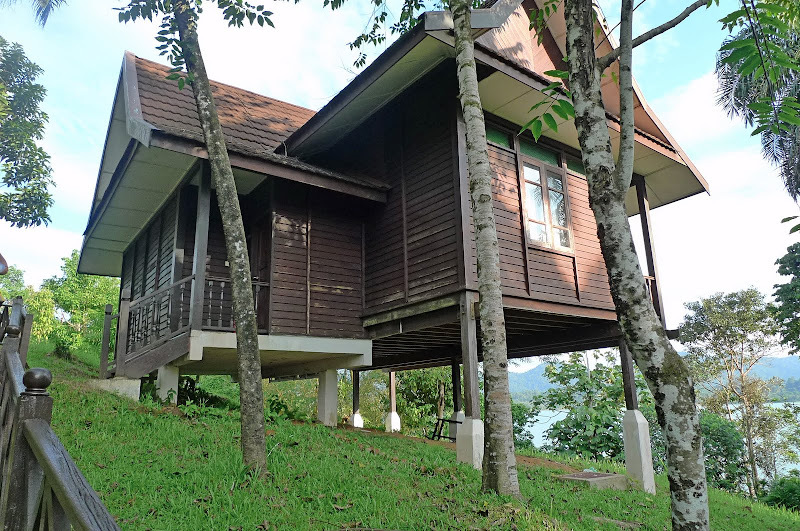 These chalets are all scattered around the lake and most of them have a commanding view of Lake Kenyir. 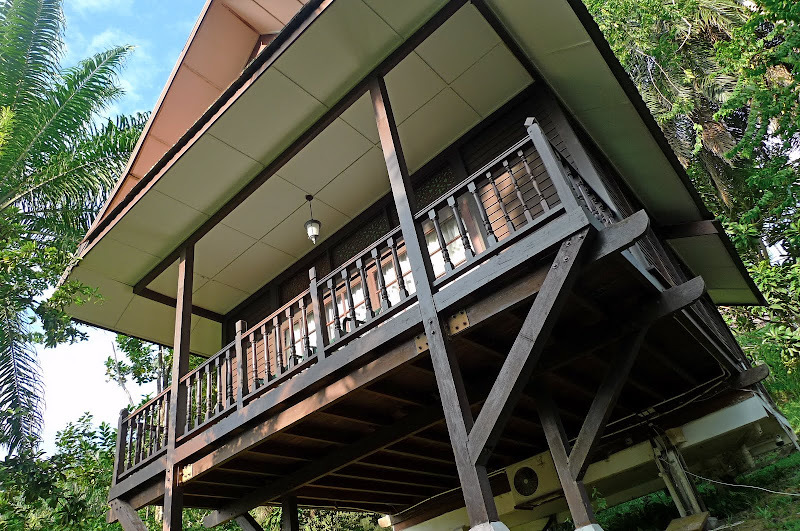 They have 4 different classes of chalet starting with the Superior Chalet at the low end, followed by Deluxe Chalet, Executive Chalet and the Kenyir Suite, which is the most expensive. This is how the more bigger chalet looks like. The chalet we stayed in was smaller. Now this is how our chalet looks like. That is the part that faces the lake. On the opposite side is the entrance to the chalet as shown by this photo below. My first impression was....What? You call this wooden house a 4-star resort?! But when we stepped into the chalet, we were completely blown away! 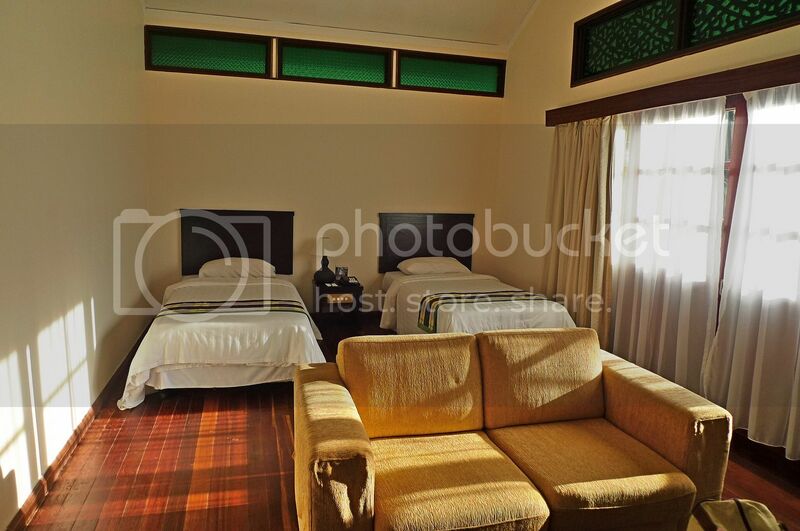 The room was not bad at all complete with air-conditioner, fan, TV and refreshments. 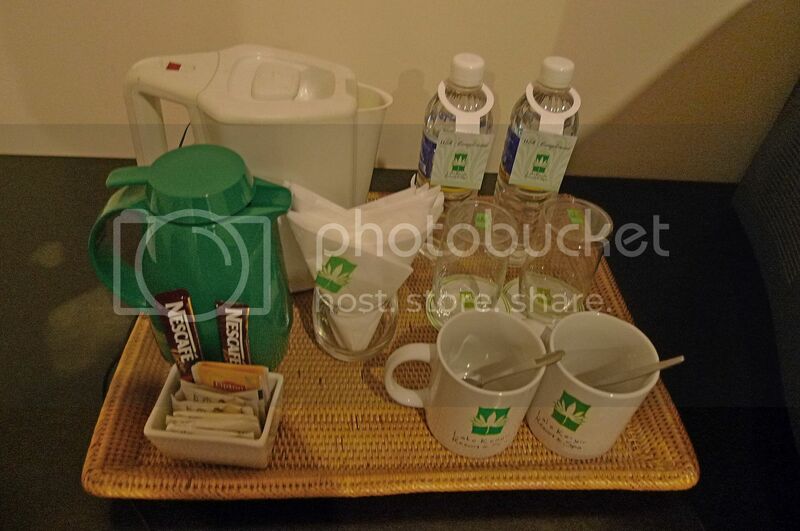 But throughout our 3 days here, I did not touch the Nescafe drinks. Just the bottled water only. I opened the glass door to the balcony. 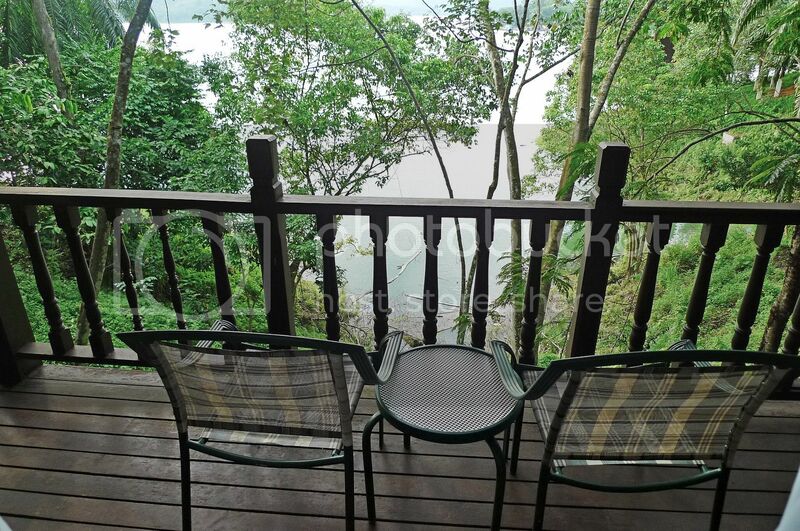 Can you see the lake in front of the balcony? Although there were many trees blocking the view, I was still pretty pleased with the chalet! 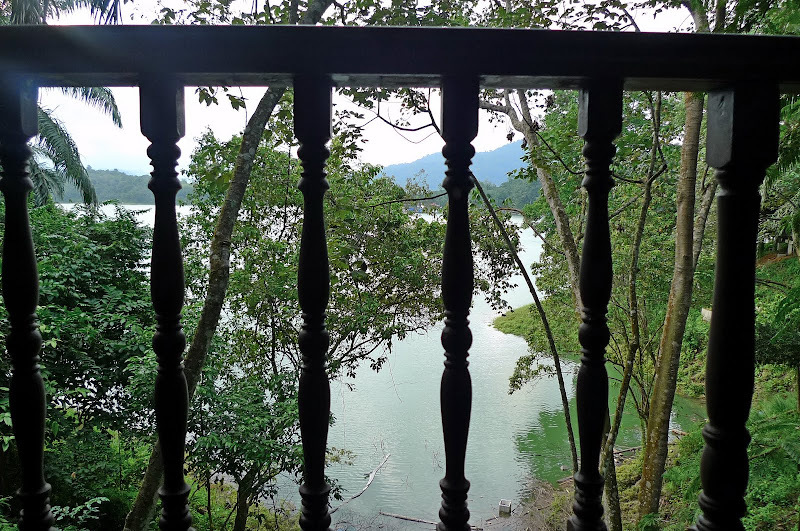 I guess if you want a better view of the lake, you would need to upgrade to a more expensive chalet, like the Executive Chalet or the Kenyir Suite! Well, if you can afford about RM400 for the Executive Chalet or RM1,000 for Kenyir Suite, go ahead! I really do not mind lazing around here and reading a book for hours and hours! The environment was just so relaxing! If you like to be close to nature, feasting your eyes on greeneries all around and listening to sounds of animals and insects, but do not like camping outside, this is it! But what impressed me most was the bathroom! It was huge and clean! There was a separate compartment for showering which was nice. It was such a pleasant surprise! This looks more like a 5-star hotel to me. Definitely not what I expected! 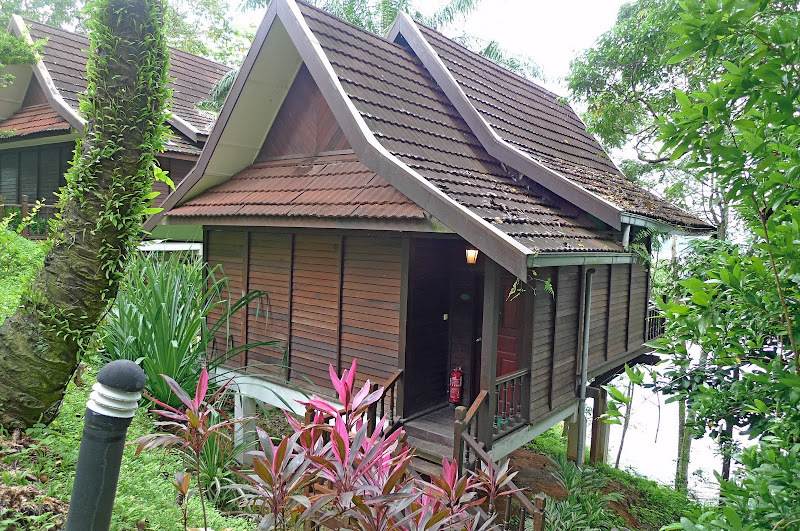 Moral of the story - never judge a Kenyir Resort chalet from the outside! LOL! After checking in and resting for a while, it was time to explore the place. Besides, the sun would be setting soon. I wouldn't want to miss the sunset! Yahoooooooooooo!!!! CHopping on a holiday it seems, YAY ME!!! You at the Gardens now Foong? ooooooh Monica right behind me hahahaha, morning Monica!!! I remember the room being oh so huge!! But tiring la to drive down there, even though I wasn't driving la... my fren drove me and my ex colleague there LOL! Anyway it was one heavenly trip for me, loved it! Nice place to rejuvenate and refresh the soul. 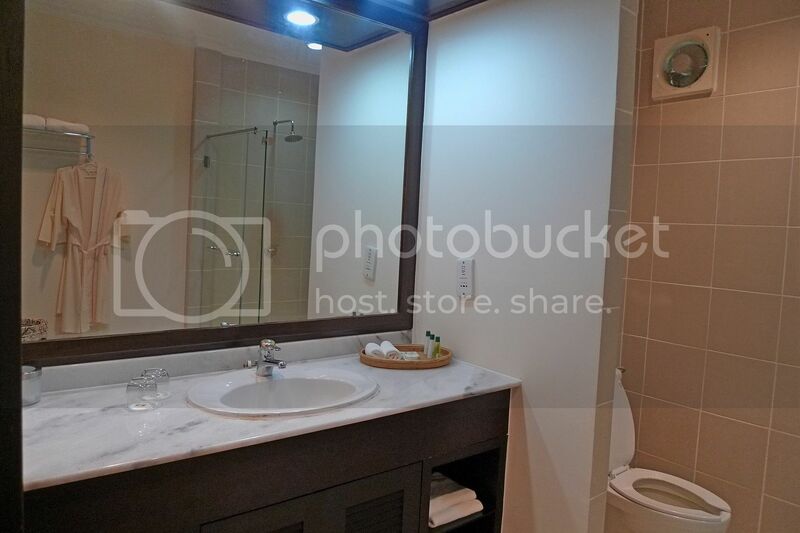 The toilet looks good, at least from the picture. The room (sleeping area) so-s0. For me, I rather stay in a big hotel than individual chalets. I very "takut" one especially if staying near forest and the like. Sure cannot sleep one. Got a lot of mosquitoes or not at night? Indeed, looks can be deceiving. Somehow, I'm averse to dark brown for chalets. Good thing the interior is not that dark color, huh? Avillion in PD has better-looking chalets but also dark brown but the ambience is really nice and relaxing. Have you been there? The bathroom looks pleasant enough. They probably encourage group-bathing considering its size. haha.. Thanks for sharing the plan. So which chalet was yours, just to give us a better idea. You didn't talk about spa treatments. Can we expect that in a subsequent post? Or were there other activities? RM450 for the whole package is a good deal, Foong, though I wasn't sure if you were bored with just reading and nature. Maybe not if you just wanted to relax in a serene environment. Any mozzies? Lina, boleh jugak kan? LOL! mariuca, yeah I was at The Gardens! Tweeting from there! LOL! Congrats for being my FC today! Lucky you read my tweets. Haha! Wow! You stayed in Kenyir Resort for free? So lucky lah you! The bathroom is pretty cool, right? I love it! You all drove there? That's tiring! Why don't just take plane? monica, oops! You missed FC very narrowly. Haha! So you think this is a good deal? Why you so "takut" to stay near forests? It's very relaxing and you can hear animals and insects sounds. Close to nature what! No reason why I didn't drink the Nescafe. haha! Just didn't feel like drinking. Actually I myself also wonder why! LOL! No mosquitoes lah, cos we switch on the air cond and shut the glass door. Haha! happysurfer, why are you averse to dark brown chalets? Yeah looks can be deceiving in this case! Haha. Haven't been to Avillion though have heard about it. 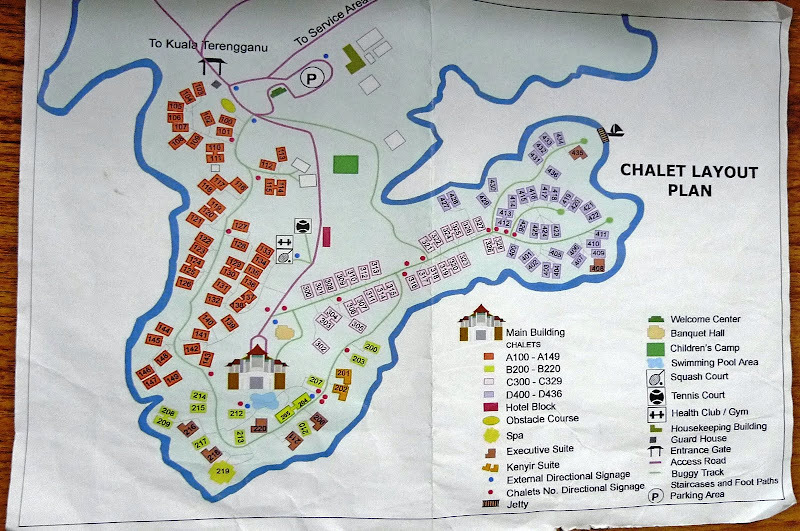 However, I will just hint that our chalet is near to the lobby/main building. Yes, will blog about the spa/massage in future post. 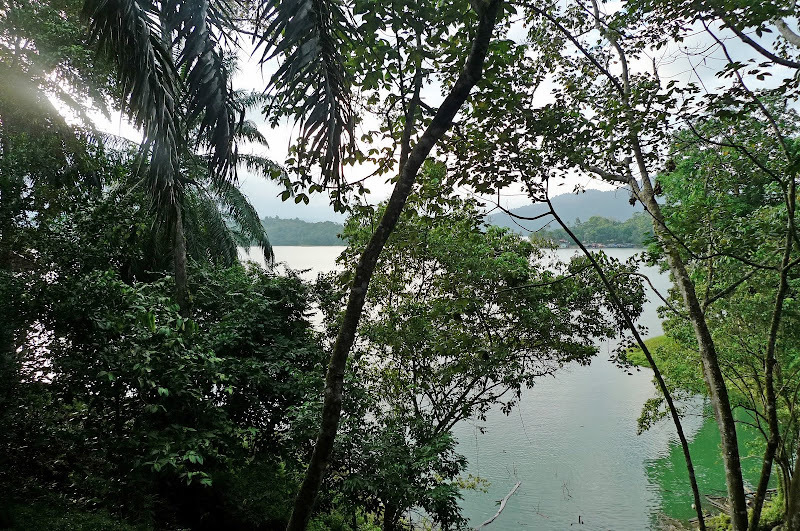 Yes and there were other activities like bird watching and boat paddling and of course the lake cruise that brought us to the herbal island and waterfall. Experiences being unable to talk or walk for weeks after a boisterous day out still haunt me lah. The deluxe room sure looked impressive! And the view of the lake from the chalet is nice. Room prices are pretty expensive eh? wow...so luxurious. the price is also beautiful? how long u will stay there? any interesting activities going on? Dark colors make the place gloomy besides more prone to attracting mosquitoes. The third picture is nice - nice angle. Nevermind about the chalet number then. Let's maintain the suspense for your story, shall we? Quick, tell us! Did you say 'herbal island'? That sounds interesting. Can't wait to read about it. Pretty nice resort! Sorry to say that my friend, if you travel with me I will never go to sleep in a resort. I will only choose guesthouse or hostel. That's my way to do traveling. By the way, is the television fully functioning, haha! the place really looks good..
lina, what? You had the experience of not being able to walk or talk for weeks? What happened? You didn't blog about this? Congrats for being Top Commenter! And you are welcome to return as often as possible to maintain your top spot! Haha! happysurfer, Oh yes I agree dark colours attract mosquitoes. But I am not dark and I still attract mosquitoes! LOL! jam, once in a while, I will indulge in expensive resorts. It's nice - you should try it! 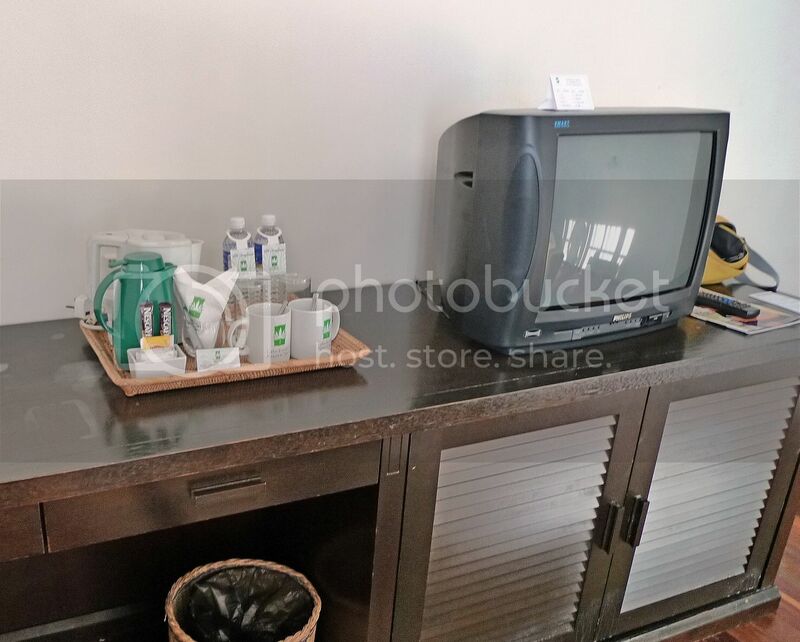 Yes, the TV is fully functional unlike the ones in Guilin Youth Hostel! LOL! what's to bet that the strange thing that happen in the chalet is a ghost. I thought I did, with my ghost story post way back but checking back, yalah, I didn't mention anything about that. Once, after spending a day of fun in Kuala Medang(somewhere in Lipis); playing in the river, yelling, laughing, etc that kids my age would do once in water, I was unable to open my mouth for a month. Cannot eat, only can fit a small straw through my mouth. After being given some water by a dukun, only then I can open my mouth. Another time, I stepped on a "busut" depsite being told not to, just to show that I'm brave, and I couldn't walk for weeks. Despite checks after checks at the hospital, the doctors can't find anything wrong with me, so a visit to the dukun was needed. A horribly painful massage follows (not the nice kind like you had in Kenyir)I was back to normal. least with a clean toilet, everything else doesn't matter. lina, wah! So scary experiences you had! I didn't know! No wonder you respect the forests now. I think it's not a good idea to have a large playful crowd in the forests too - sometimes we might disturb and irritate those things. I stayed there two years ago. Lucky I brought my girlfriends and children along, otherwise I would be a little scared at night. Nice place, but if go with more friends would be safer and more enjoyable. Yupe! it is a man-make lake alright! :p Learnt this in our Geography right? But I didn't know it has 340 islands and 14 waterfalls. Goodness. War...there's a 4 star resort there? Sounds like a little expensive o the chalet rates. Holy smoke...the view is really beautiful. No wonder they are charging you so much. 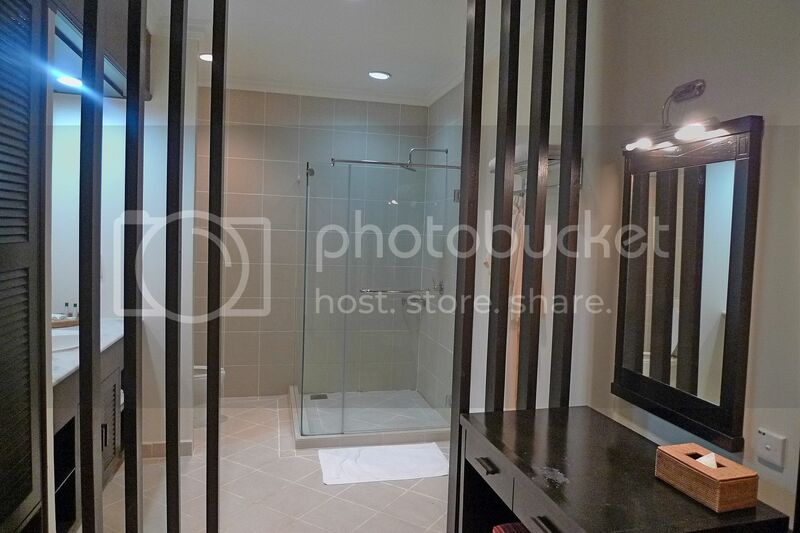 Looks like a really nice room! How much was it for? Suite RM400? Not bad for the price :D.
Wow... makes me want to suggest to my company to go there next year! Then I would definitely tag along! hahaha! The bathroom is very big! 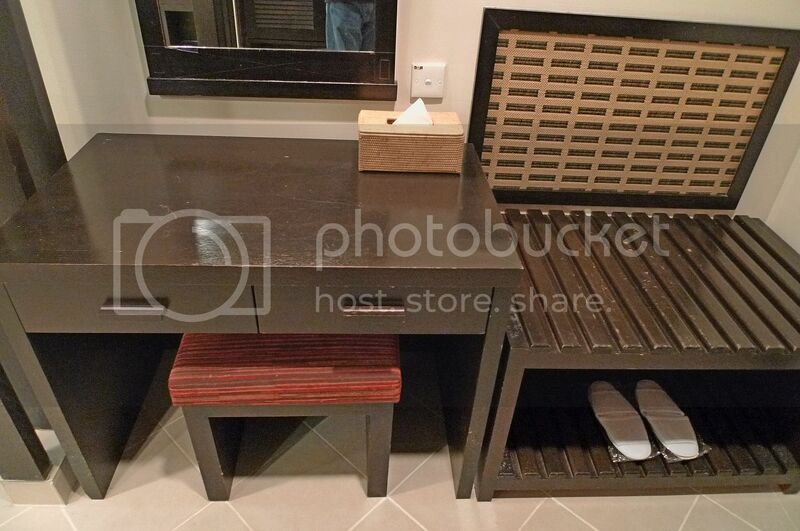 Thumbs up for this chalet! This place is so nice foong! tekkaus, haha will let you know about the scary experience in future post! It's a little expensive but it's 4-star. 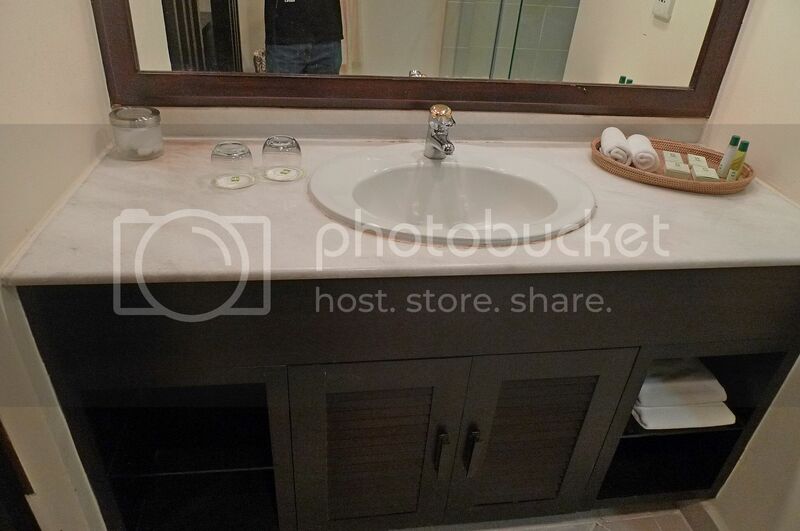 And you get really nice bathroom! Oh yes! It's definitely better than most hostels I stayed in China. Haha! Some newer hostels also include en-suite accommodation with single, double or quad occupancy rooms, though to be considered a hostel they must also provide dormitory accommodation. Some hostels are mountain huts that require extensive hiking to get to while others are in urban jungles of towering skyscrapers.